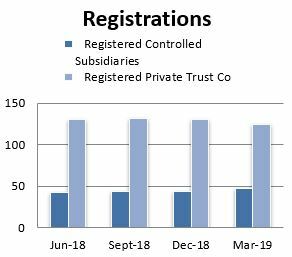 As at 31 March 2019, the Fiduciary Services Division had supervisory responsibility for 143 active trust licences, which compared to 142 active trust licences as at 31 December 2018. 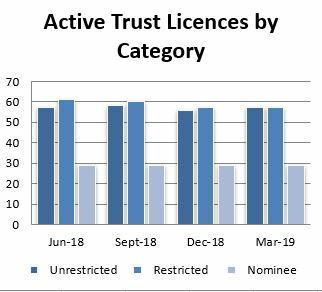 The 143 active trust licences as at 31 March 2019, were comprised as follows: 57 Trust Licences, 57 Restricted Trust Licences and 29 Nominee (Trust) Licences. Additionally, as at 31 March 2019, there were 47 Controlled Subsidiaries and 125 Private Trust Companies Registered with the Fiduciary Services Division.